How thick is the pile of a carpet? When should I use under-padding? 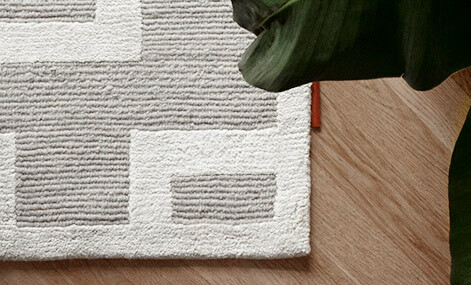 Why do the fringes of a carpet vary? My carpet has different shades/nuances, is there a fault or defect in the carpet? Are the photos of your carpets close to reality and how can I be sure that the colour I see on the screen is the real colour of the carpet? How is it possible to sell luxury carpets with very cheap prices? Do you offer interest free payments or other payment plans? Do I have to pay for the shipping when I return my carpet? We recommend under-padding (Super Stop) for thinner carpets since it prevents the carpet from slipping and helps it stay in place. It also provides more cushioning, thus prolonging the life of your carpet by preventing pile crush, and protects the carpet from the effects of sharp objects like heels. A fringe is the extension of warp strands; they are knotted at the ends to ensure that the wefts and the knots do not unravel. The exact length of the fringes depends on the weaving of the carpet and who made it. Fringes are sometimes trimmed short, sometimes long, and in older carpets they may be braided or non-existent. 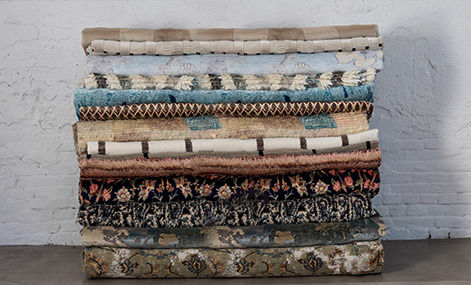 The type or length of the fringe of a carpet has little to do with its value or quality. Handmade carpets have imperfections since they are handmade, and this adds to the value, interest and characteristic of the carpet. In nomadic carpets, most variations are not intentional, but simply due to the fact that it is much harder for nomadic weavers to manufacture the carpets, than it is for workshop weavers. The looms used in rural areas are usually very basic horizontal looms placed on the floor, which makes it much more difficult to knot a perfectly symmetrical rug. This is not a fault in the carpet. What you see is known as an Abrash. An Abrash is a Turkish word meaning partly coloured. This difference in nuances is commonly found in nomadic carpets, and it occurs when a weaver uses yarn from a dye that was not done in the exact same shade as the previously used. The Abrash, therefore adds more character and charm to the carpet and also reminds us of the working conditions of the carpet weaver. The photos of our carpets are taken professionally with a high resolution digital camera in a color-temperature controlled environment and the photos are then processed using Adobe Photoshop. The photos of the carpets are therefore, as close to reality as the real carpets. However, it also depends on the type, quality and age of the screen one uses to view the carpets and this can affect how the photos and colors are displayed on your screen. We have buyers who continuously visit and inspect the villages, workshops and resident nomads where some of our carpets are produced. They monitor the production of these carpets and also check the working conditions and that no children are involved in the production. It had previously been common that child labour was part of the culture in the making of hand knotted carpets, but this has since changed over the years due to the pressure and awareness that has been raised on the issue of child labour worldwide. The carpets are fully usable but they have a few minor flaws. The flaws concern colour bleeding, slight wear, improper abrashes, abnormally uneven edges or yarn and colour quality which by CarpetVista standards are not considered to be sufficiently good for these carpets to be included in the normal range. The carpets are sold in their existing condition and the faults they have are mentioned in the fault description. The majority of faults can be put right or mended if desired. It is not economically tenable for us to put these faults right so we are instead selling these carpets at strongly reduced prices. There are some customers who choose to repair the carpets themselves or who consider that slight wear and colour-bleeding does not mean anything if, for example, the damaged part is covered with a piece of furniture. In many cases the damage is only visible upon closer inspection and you notice nothing if you do not look for it. In shops or at auctions this type of carpets are sold without problem, but they do not suit CarpetVista’s high quality policy! It is not unusual for a new handmade carpet to fluff. During the first few weeks surplus wool that has been trapped in the pile begins to surface and is gradually released. 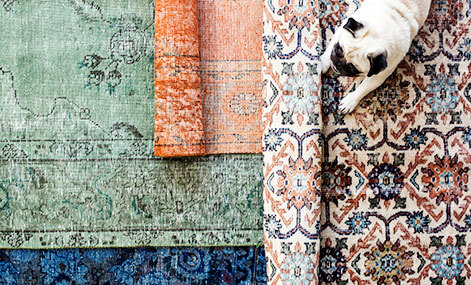 In Persian carpets this often disappears after 1-2 vacuum sessions, but in Indian-made carpets it can take a bit longer. There is nothing to worry about and trying to speed up the natural process will only cause extra wear and tear to your carpet. The best advice is to be patient and with general use you will see that the fluffing gradually slows down and eventually ceases. There are two main reasons. The first is that while we sell carpets around the world but we do not own a retail store anywhere. The second is that we sell products in large quantities and we can offer products at the lowest prices. No, unfortunately we do not have any store or exhibition where one can view the carpets. We only sell our carpets in our web shop on the Internet, and you can only view them on our website. 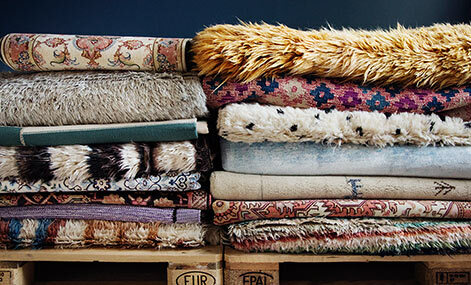 If you are interested in purchasing a more exclusive carpet (value of 5000€ or more) it is possible to arrange for a visit to our exclusive showroom to see the carpet before making your decision. No, we do not have a catalogue since all our carpets can be viewed on our website. By having all our carpets on the website it is easier for us to constantly update the information on our carpets, therefore providing more accurate and current information to our customers. Begin by selecting the carpet you want to buy. Click on the carpet for more detailed information. On the right-hand you will see the price of the carpet. If the carpet is not sold or reserved, there is a button under the price with the text: “Buy”. Click on the ”Buy” button to place the carpet in your shopping cart. The shopping cart is shown on the top left-hand side of the website. 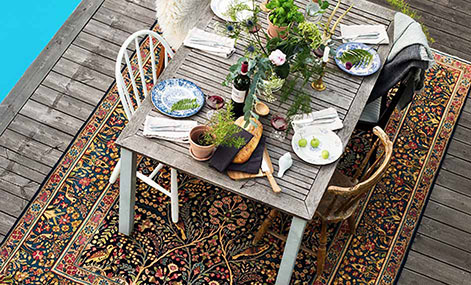 The same procedure can be repeated as indicated above to add several carpets to your shopping cart. The next step is to go to the checkout counter. You do this by clicking on the link "Proceed to Checkout" that is visible under the carpets in your shopping cart. The final step is to choose your payment method. You can pay with a credit card or by bank transfer. Click on the alternative you wish to use and follow the instructions given. 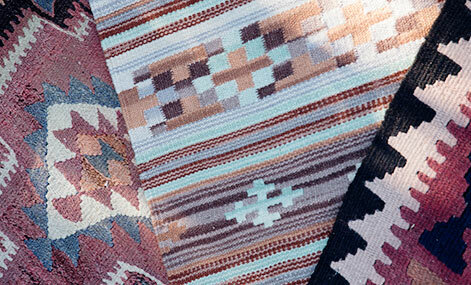 Putting a price on a handmade carpet is very difficult. The price can be decided depending on the quality of the wool, the colours used, the design of the pattern, but of course also if it is an old carpet or a carpet that is hard to find these days. Nomadic carpets for example are much harder to find nowadays making the prices higher on them. It is not possible to borrow a carpet. If you purchase a carpet and find that it doesn’t fit in as expected you can return it within 30 days. The transactions on our website are very secure and we co-operate with DIBS which handles all our Internet payments. All payments are made on a safe encrypted connection for your security and to protect and prevent our customers from fraud. All payments are authorized with a technique know as 3D-Secure. All payments are also controlled manually for your safety. At the moment we only offer interest free payment through Klarna for those who reside in Sweden, Denmark, Finland and Norway. 3D Secure is an umbrella term for a security technology that has been developed by VISA and MasterCard in collaboration. The idea is that the cardholder must identify himself/herself by typing a personal code when purchasing online. The customer obtains this code from their bank. When using this technology the bank that issued the card assumes responsibility to cover the economic risk in connection with potential fraud. This technology which was put in place to protect the customer is often referred to on websites as Verified by VISA and MasterCard SecureCode. CarpetVista utilizes this technology when a payment is made with a card for which this technology has been activated. If you want to cancel an order, please send an email to order@carpetvista.com and we will cancel the order and confirm it for you. You can also log in to your account and cancel the order by yourself. If you want to change an order then send us an email to order@carpetvista.com and let us know what carpet you would like instead of the one ordered. Please note that we can only change orders that have not been sent out and those placed with the option “Bank transfer” meaning that they have not been handled or sent from our warehouse! We always offer at least one free shipping alternative within the EU. Outside the EU costs vary from country to country and detailed information can be found in our “Terms and Conditions”. The normal delivery-time is 1-5 workdays within the EU and 2-8 workdays to other parts of the world. Yes someone needs to be home when the delivery arrives. You can contact UPS/FedEx/DHL for further information about the delivery-time or for help changing the delivery address. After you have placed your order and it has been packed you will receive a confirmation email from CarpetVista.com. This email contains shipping information and tracking information. You can use this information to track your order through the UPS/FedEx/DHL website at www.ups.com / www.fedex.com / www.dhl.com.You can also track your orders by logging in to CarpetVista.com using the password and username you registered with and click on “My account”. Yes, you can return your carpet if you do not like it. You have a 30 day money back guarantee. Read more in our "Terms and conditions". To make a return you have to personally contact us either by phone #TEL# or fax: +46 (0)40 - 18 22 25 or email us at order@carpetvista.com and let us know that you want to make a return. We will then send you a return dispatch note by ordinary post which contains packing labels and instructions on how to deal with your return. All our carpets are packed according to instructions from UPS/FedEx/DHL. The carpets are folded and placed in a thick protective plastic bag that is sealed together using heat. Runners are rolled. All returns within the EU are free when using a All returns within the EU are free when using a CarpetVista return shipping label. Contact our customer service team for assistance with returns.